If you are looking for a quick way to whitening your teeth at home Philips Zoom Whitening Pens could be the solution. These whitening pens, which are suitable for use on most teeth types, promise great results and very little effort (view on Amazon). Though teeth yellowing is a natural ageing process, it can sometimes be the cause of insecurities. While stained teeth is often associated with bad habits, white teeth communicate self-care and responsibility. As a result, whitening your teeth can make you feel more confident in your own skin. Philips Zoom Whitening Pens are a comfortable way to whiten your teeth at home. However, a thorough application can sometimes be difficult. Research can help you to achieve the best results. Read on to find out whether these Zoom Whitening Pens are right for you. The Philips Zoom Whitening Pens are easy to use and can be applied effectively from the comfort of your home or office. However, when used incorrectly, you might experience some discomfort in the teeth and gums. 1.) Do Philips Zoom Whitening Pens work? In short: yes, they do. The Zoom Pens are an easy-to-use whitening system that uses a pen-like applicator to whiten your teeth without a mess. The pens use a bleach (hydrogen peroxide) to break down the colour of the stain, making it appear white. Whitening pens release a gel containing the bleach, which solidifies into a thin layer. However, this gel can easily travel to your gums and cause irritation, unlike other products such as whitening strips which seal the whitening gel into the teeth. The whitening pens also need more than one application to be effective, unlike whitening kits which also use gel, but can be a one-off treatment. But whitening pens are easy to use. Simply click the bottom of the pen to release the whitening gel and apply on your teeth like you would with nail polish. You can achieve the first shade lift after two weeks of application (view details). 2.) Are Philips Zoom Whitening Pens safe? As with any whitening pens, the Philips Zoom Whitening Pens can cause side effects if incorrectly used. Tooth sensitivity happens when the peroxide present in the whitening gel gets through the enamel and comes in contact with nerves inside the tooth. However, the sensitivity is usually temporary and the Zoom Pens can certainly be an inexpensive and efficient alternative to professional whitening. You can see results after 2 weeks of consistent application. However, the results are also dependant on the proper use of the product. For example, as the gel used in the pens is not protected from the oral environment, you can accidentally wash it off if you don’t wait the proper time window between application and consuming foods. Brush your teeth and floss as usual. Press the button at the bottom of the pen to dispense the product to the brush. Apply a thin layer of gel to the teeth like you would paint your nails or color in a drawing. Avoid eating or drinking for the next 30 minutes after the application. Use it twice a day for 2 weeks to achieve the shade lift. There is no provided information about how long the results will last exactly, but it ranges between 6 months and 2 years. Because Philips Zoom Whitening Pens are not a substitute for dental care, you will get better results if used consistently and keep a good oral hygiene routine. As tea, coffee, wine and smoking being the main culprit of yellow teeth, avoiding these will ensure lasting results. The Zoom Pens are suitable for anyone who has limited time and is often on the go. It is designed for adults and cannot be used by anyone under 16 years old. As any whitening pens, the Zoom Pens are likely to be messy and may cause gum irritation. If you have particularly sensitive teeth and gums, whitening strips may be a better alternative as they have a physical barrier between the whitening gel and the rest of your mouth. Amazon also sells a version of the Zoom Whitening Pens with the only 1pk. Philips recently included the Zoom Whitening Pens in their Sonicare oral hygiene line. 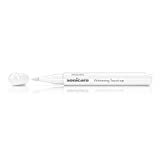 These are now available as Sonicare Single Whitening Touch-Up Pen, which comes in both a pack of 1 pen and 2 pens. Whitening products are made of active ingredients, which are directly responsible for whitening, and inactive ingredients, which help the product to work well. The Philips Zoom Whitening Pens are easy to use, easy to carry around and only need 30 minutes to act. Hence, they are a great product for those who are looking for a quick way to improve the whiteness of their teeth. See how the Philips Zoom Whitening Pen compares in our Best Teeth Whitening Pens round up. How long does one pen last for? Each pen lasts for approximately 30 days. Will they work on veneers? No – the pens don’t work on any dental work. This is because the surface is not porous and the bleach cannot seep into it. Can I use this instead of going for whitening sessions with the dentist? The Zoom Pens are not meant to replace professional whitening or any dental care. Can I use it on my child? Zoom Pens should not be used on anyone under 16. Are they dangerous to use? Whitening pens are not dangerous, but they could cause gum irritation if not properly use or if you have gum sensitivity. Can I use it on-the-go? Absolutely. The Zoom Pens are designed to be easy to use, wherever you want. I click and click and no gel comes out of the pen? It may take up to 10-15 clicks the first time you use the pen for the gel to come out. Is it safe to digest? Yes – the gel is safe to ingest in small amounts. If you have any medical condition, please speak to your doctor before using this product. I have braces, can I use the pens anyway? Unfortunately, the Zoom Pens cannot be used if you have braces or over any dental appliance. Can the pen be refilled? No – you should discard the pen once it is finished. What percentage of hydrogen peroxide does it contain? The Philips Zoom Whitening Pens contain 5.25% hydrogen peroxide.